How many social networks do researchers really need? I realised the other day that I now have profiles on about eight different sites which have some kind of social networking functionality. Facebook (mostly for personal stuff) and Twitter (mostly work-related stuff) are the ones I tend to use the most, but I also have profiles on LinkedIn and Google+. I also have profiles set up on a number of more specialist academic/researcher networks – Academia.edu, BiomedExperts, ResearchGate and Mendeley. The only one of these I use regularly is Mendeley, and that’s almost entirely for the reference-management features, rather than the social connectivity side of it. For most of them I signed up to see what they were about, and then hardly ever looked at them again. Keeping track of them all is starting to become a major headache. When I publish a new paper, in theory I should go to all these separate accounts and add it to my profile on each one. In practice of course, I rarely bother and so my accounts languish mostly unused. The reason why I’m not more actively using my accounts on, say, Academia.edu or ResearchGate is that they offer me very little that I can’t get elsewhere. Each one offers a slightly different feature-set, and they all seem to be reasonably well-built sites, but if I want to talk about research, then I’m more likely to do it in seminars, conferences or in the pub than on social networking sites. The exception to this rule is of course Twitter, which I’ve found to be an incredibly powerful way of sharing, discovering and talking about new research with more and various interested and expert conversants than I ever imagined. 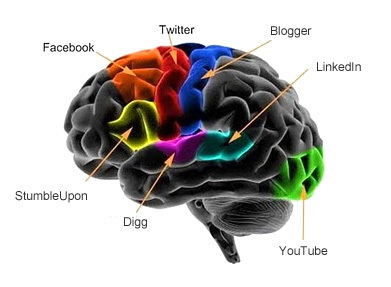 The killer feature (as with any website these days) is of course content, and in the case of social networks the content is the people that use them. Facebook is now pretty much essential to my social life because almost all of my friends actively use it. If a network existed which included almost all of the people that I was interested in talking to about research, then actively using it would be well worth my while. Unfortunately, none of the specialist academic networks seem to have taken off in terms of their user-base in the way that Facebook has for a more general audience. There was a brief flurry of excitement (ironically, mostly on Twitter) about Google+, and particularly its ‘hangout’ feature, for academic collaboration, but that all seems to have died down, and after a couple of weeks of playing around with it, my Google+ account is now as moribund as all the others. So, where can we go from here? There seems to be a lot of optimism (and investment) around the idea that a specialised social network for researchers might be a useful thing, but so far no-one seems to have cracked it yet. As this article notes, the only way researchers will start using these tools regularly is if they fill some kind of currently un-met need. My motivation for using facebook is that it makes my life easier – instead of feeling guilty for never e-mailing or calling my friends I can just read their status updates and at least maintain the illusion that I’m in touch with their lives. Researchers are generally busy people and would probably welcome some online tool which could make their lives more efficient. Unfortunately, most of our needs seem to be pretty adequately met by relatively simple tools which are currently available (e.g. RSS readers for keeping track of the latest publications/blogs). Until a network comes along which has a) a really killer feature-set and b) a sufficiently wide user-base, these specialist academic networks are probably destined to struggle, and many will likely fail once their start-up funding runs dry. I’ve previously written about the importance of response hardware for doing timing-accurate experiments – in a nutshell, anything you connect via USB is likely to be sub-optimal,* because the operating system only polls (or looks for an input) on the USB port some of the time – in Windows the USB polling rate is 125Hz, or every 8ms. So, for accurate timing of responses, we want to use something other than the USB port. 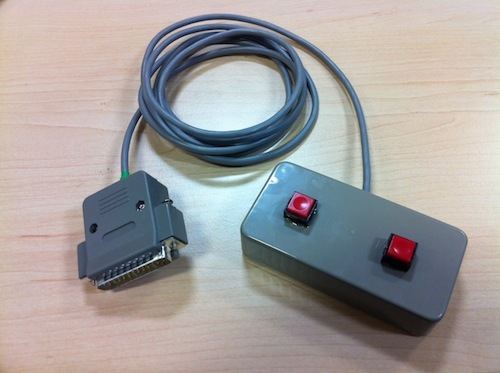 There are various options – my personal favourite is to use the 25-pin parallel (or ‘printer’) port. Some newer desktop models unfortunately don’t have parallel ports anymore, as they’re largely obsolete for connecting peripherals, however any model older than two or three years should have one – and you generally don’t need a super-fast, up-to-date computer for running stimulus programs and collecting data. Circuit Diagram for a six-button, parallel port response box. Reproduced from Voss, Leonhart and Stahl (2007). It’s just the switches, and a 100-ohm resistor for each one, wired up to different pins on the data register of the port, with a common ground (pin 18). Honestly, if you were being lazy, you could even just forget about the resistors and it would still work fine. I decided not to take apart any mice, but just to use some buttons I bought off-the-shelf, as I only needed two for each box. Getting the right buttons is really important for this kind of thing – you want them to be a decent size, and have a good clicky-action, without being too difficult to depress. I also got some small plastic boxes, some multi-core cable (I used standard network cable as it’s quite stiff and robust, but almost anything will do), and some parallel port plugs. You can buy everything you need from Maplin or Radio Spares (Radio Shack, if you’re in the US) for about £10-15. I just drilled some holes in the boxes fairly roughly and secured the buttons there with a dab of epoxy resin, but you can get as fancy as you want in that respect. The only really tricky bit is deciding which pins on the parallel port you want to wire your switches up to. This will largely be determined by which pins the software you’re going to use can read from. 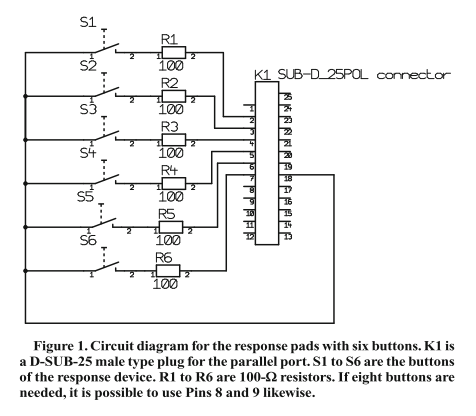 Psychology software like Inquisit or E-prime is able to read inputs from pins 2-9 on the data register (see below diagram) but it’s worth doing a bit of reading about the different pins on the parallel port and what they’re used for. A good place to start is here. Probably what you want to do is use one of the data pins for one pole of each switch, and wire the other pole to a common ground pin, as in the above diagram. Nice, huh? Happy soldering! TTFN. *Not quite true – some of the expensive button-boxes you can buy from psychology software companies are USB, but have their own electronics inside them to get around this and time things accurately. All content copyright the author etc. etc. yada yada. Basically just don't be annoying and steal my stuff. It may not look like much, but it's mine, dammit.